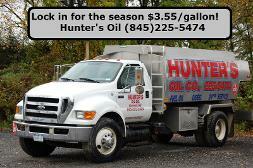 Hunter's Oil Co. is pleased to announce a fixed price option for our automatic delivery customers this heating season! With automatic deliveries the system calculates when you are due for a delivery based on temperature and average consumption. When the system generates your ticket we schedule a delivery to top off your tank. The day after your delivery your credit card is charged. As a courtesy to our automatic delivery customers, credit card charges are waived. What is the lock in price? During the lock in period you will pay a fixed rate of $3.559/gallon regardless of market conditions. What is the lock in period? Our lock in period is November 1, 2014 - March 31, 2015 when the prices of oil typically skyrockets. The rest of the year you will be charged the daily variable rate which is typically lower. Is there a fee to lock in? Do I need to pre buy the oil? Do you offer price caps? Yes. We will be offering a limited number of price cap options. Please call the office for details and pricing. Yes. Budget plans typically start in April. Please call the office to discuss budget plans. Print our fixed price contract. Fill in the information on top and sign the bottom.